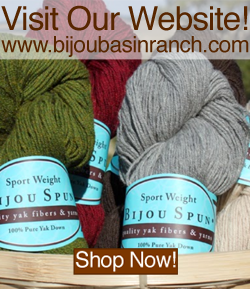 Many of our longtime fans know Bijou Basin Ranch as the source for unique luxury yarns to knit and crochet, but did you know that we also raise our own herd of yaks which contribute fiber to the making of these yarns? Some of you might know a few of our yaks by name, but if you are a newer fan, you might be wondering...just who is Napoleon, Ruby, and Knit & Purl!? In the first installment of a three-part video series presented by Interweave Craft, you'll not only get to meet Carl and Eileen Koop, the owners of Bijou Basin Ranch - you'll also be introduced to the entire herd! We hope you'll take a few moments to watch the video below to learn more about the Bijou Basin Ranch story! We're giving one lucky blog reader a chance to win a stylish and warm 100% Yak Yarn Wrap. To be entered into our drawing, simply leave a comment on this blog post telling us what was your favorite part of the video! For bonus entries, you can choose any (or all!) of the actions below - just be sure to leave an additional comment on this post telling us you did so for each action! Win this luxurious Yak Wrap! We'll be randomly selecting one lucky person from the pool of entries to announce on our next blog post on Monday, November 24. Good luck! My favorite part was when the feed the yak a treat. I love how sweet the yaks are! I love seeing the yaks run down the hill like a big puppy dog! I love when you rub the chin of the big yak and see how much he likes it. It reminds me of an encounter I had with rubbing a Scottish highland cow which resembles a yak very much. I have been a member of your Ravelry group for some time now and enjoy it very much. I have subscribed to your postings on You tube and look forward to learning even more about the beautiful yaks. I have subscribed to your newsletter and look forward to learning even more about your yaks and your business. Yaks running down the hill, so cute! I love how you see the live Yak and imagine them as yarn! The yaks are so fluffy when they are bounding down the hill! I love watching them run...like much larger versions on my goofy Rottweilers! I love to watch them being fed. And I am following you on Pinterest. I would love that wrap. I like the parts where the animals are being petted. They are so docile and friendly -- I had no idea. Interacting with them and petting them is my favorite part of this video. I like the interaction between Carl and Eileen and the yaks - like big puppies!! I've been a fan for years, you can even say before the Bijou Basin Days. Carl is such a great storyteller. I love listening to him tell stories about the yaks, his rescued dogs and by-gone days of computer geeks out late at night. Keep doing what your doing! My favorite part of the videos was watching Carl and Eileen with the yaks. You can really see how much they love what they are doing. Here's to you two fantastic entrepreneurs! I follow you on FB (Susan Anne), Pinned Ruby on Pinterest (Susan), follow you on Ravelry (Sudo8858) and Instagram (sdfunke), I don't tweet on the tweetie and don't get you newsletter, since I follow you anyway :-). Will be looking for you on YouTube to scribe. Keep the videos coming and the stories flowing! Cool to meet the contributors of your very unique yarn! Yeah, Yaks! Love the yak saying not to the food. I love the Yak Lean! Seeing how calm the yaks were with all the people around. Now I want a baby yak! I liked when the yak's head was pressed against someone's leg while it was being petted. 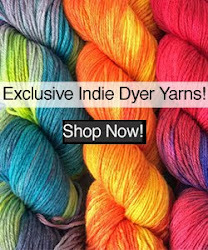 Follow you on Facebook, Ravelry, and newsletter. Loved to look at all the cute yaks. They are just to adorable. Oh, those faces! So, so sweet! They are beautiful and I had no idea they were so docile and friendly! Loved seeing them enjoying some human contact. I just love seeing the yaks playing. I just joined your Ravelry group (HOW was I not already a member?). That one yak running down the hill was SO cute!! I just love seeing the yaks. I want to hug one. I liked how he talked to them like family. I had the pleasure of meeting Carl (and buying yarn!) at the Black Sheep Gathering in June. I loved hearing his stories of how the yaks will swim down the river in the summer. I must say my favorite part is whenever the yaks get petted. I would love to be able to walk among them and pet them like that! PS followed you on FB and signed up for email letter..already on Rav board and follow you on Twitter. My favorite part was the phrase "big tough macho yak rancher"! I joined your rav group, which I had thought I already belonged to, but apparently not! I loved hearing about how excited you are about the baby calfs......so adorable! Definitely the yak gamboling down the hill like a little kid! When you fed the big one and the smaller one came up reminded me of my bernese mtn dog, always afraid someone is getting more than she is! They are so cute.. and I love that they love the chin scratching! I loved just seeing the yaks...such magnificent animals! I am a member of your Ravelry group. Love the chin tickling by Carl. They seem like very docile animals. I have joined your Ravelry group. I love seeing how friendly they are! I love how Carl interacts with them. It's so sweet. My fav part was watching them come down the hillside. I always thought of yaks as being slow moving. I'm in your Ravelry group (spanishviolet). I liked the way the yaks ran down the hill and their tails kinda fluffed out behind them. I did all the actions except subscribe on the you-tube channel. Will try to do that later. I loved the yaks strolling down the hill, and also the fact that they wanted so much attention from their humans..... I bought some of your yarn at Stitches West and it was marvelous. Hope to win. Fingers crossed. I have been a member of your Rav Group for some time. I loved to see the yak enjoying the chin scratch! Too cute! I love to see how gentle the yaks are. They are almost like a bunch of puppies who love their treats, and like to have their heads scratched. Beautiful creatures! I loved seeing how gentle the yaks are and how much the owners truly love them. I joined your Ravelry group. Head butting reminds me of my cat Bella . . . only much bigger. Charging down the hill, scruffing their neck, seeing their different personalities! I'm HH and without closed captioning I miss most of what is being said and can not comment with these details. Some looked funny. I enjoyed the one bounding down the hill. I didn't know their tails could be so fluffy. I have joined you Ravelry group.